With the 67th overall pick in the 2014 MLB Draft, the Red Sox have selected Sam Travis, a first baseman out of Indiana University. The 6-foot, 200 pound Travis was originally selected by the Cincinnati Reds in the 40th round of the 2011 draft out of Providence Catholic High School (New Lennox, IL). Ranked the 56th-best prospect by Baseball America and 66th overall by Perfect Game, Travis hit .347/.415/.576 with 12 home runs and 58 RBI as a junior this season for Indiana. Travis is deemed to be one of the best all-around college bats available in the draft by MLB.com, possessing good bat speed and a quality eye at the plate. Travis has primarily played first base, even though he did spend time at third when he played for the Yarmouth-Dennis Red Sox in the Cape Cod League in 2012. Helping lead Indiana to the College World Series in 2013, Travis played through a broken hamate bone and won the Most Outstanding Player award at the Big Ten Tournament and the NCAA Regionals. 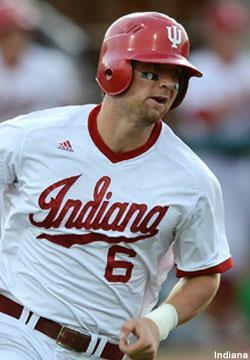 During his three seasons with Indiana, Travis hit .327/.410/.544 with 31 home runs, 55 doubles and 165 RBI in 184 games. Travis had nearly as many walks as strikeouts over the course of his collegiate career, drawing 93 walks in comparison to 94 strikeouts. The 67th pick holds a slot value of $846,800.